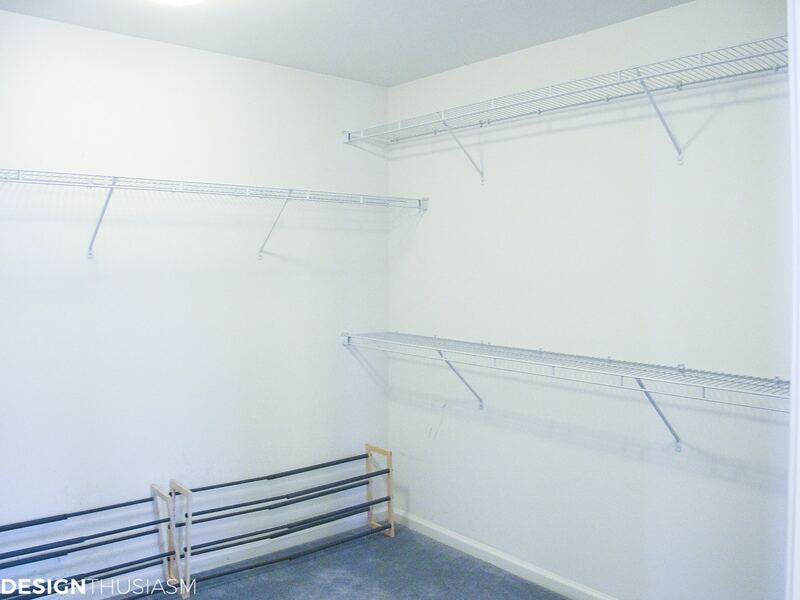 In this post: This master bedroom closet remodel shows how the key to staying organized is to set up systems that are easy to maintain. I have a confession. I’ve always been obsessively organized! Whether it be my desk, my closets, my computer files, or anything else, I can’t relax if things are not perfectly in order. Keeping things neat comes naturally to me, but that’s not the case with everyone else I live with. What I’ve learned over the years is that the key to organization is having systems in place that make upkeep foolproof. Anyone can clean out a closet, but keeping it that way despite daily pressures is the real challenge. Starting with the master bedroom closet remodel, I’m sharing with you my top closet organization tips that are easy to maintain. I’ll also confess, my DIY skills are confined to design. So, I knew I’d be working with a closet company to fulfill my plan, but many of you can achieve these goals doing the building yourselves. 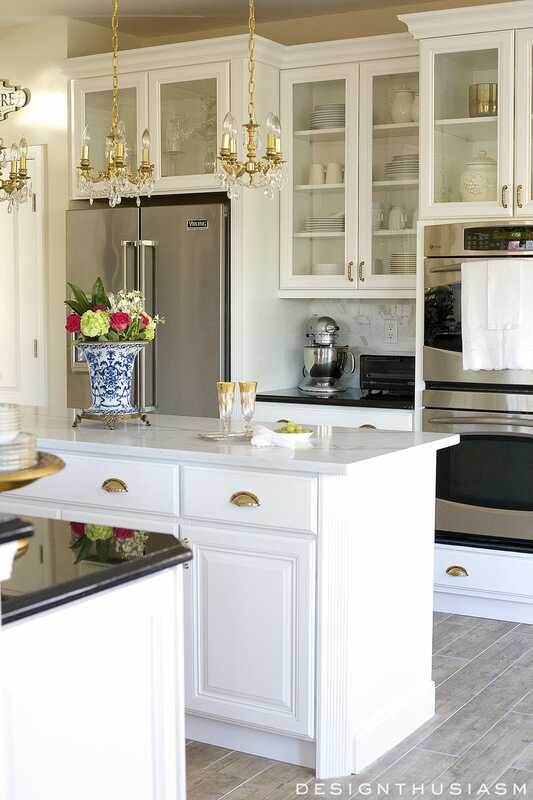 Hanging space is fairly obvious, so most of what I’ll address is the rest of your ‘stuff’. I prefer to keep my perfume and makeup somewhere other than the bathroom to keep it fresh and free from humidity. If you have a spot for it, it’s nice to keep perfume bottles on a tray atop a small display shelf. Folded items are where I get crazy obsessed. 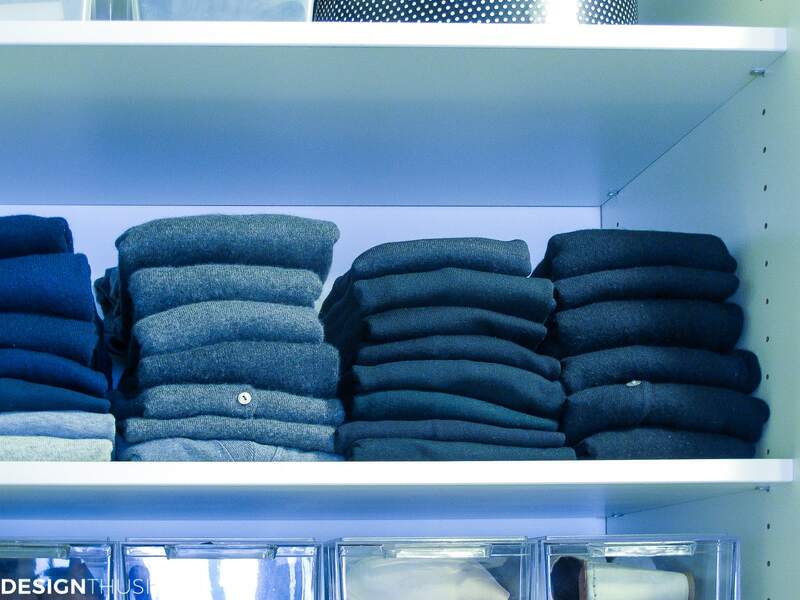 The whole point of being organized it to be able to find your things when you are rushing to get dressed, so I always keep my sweaters grouped by color. For my black sweaters, which I have many, I segment even further and group by knit quality. 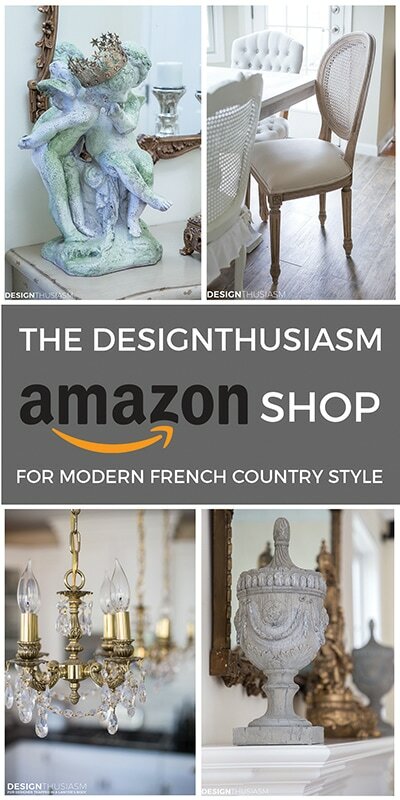 It’s actually a pleasure to see your things grouped this way. 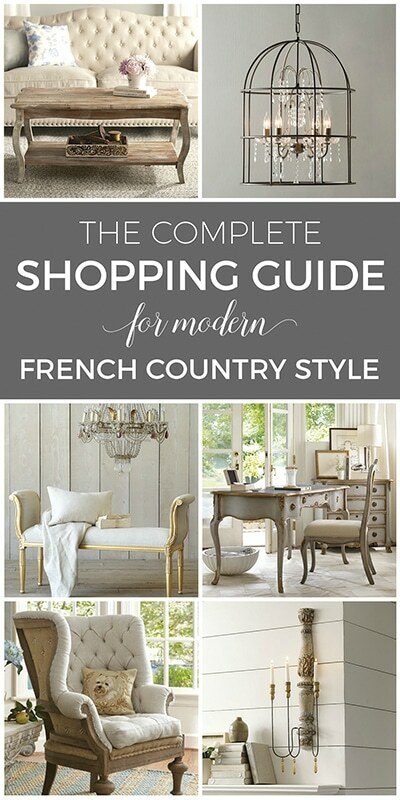 It also helps to show you at a glance what colors you have enough of when you’re going to shop. 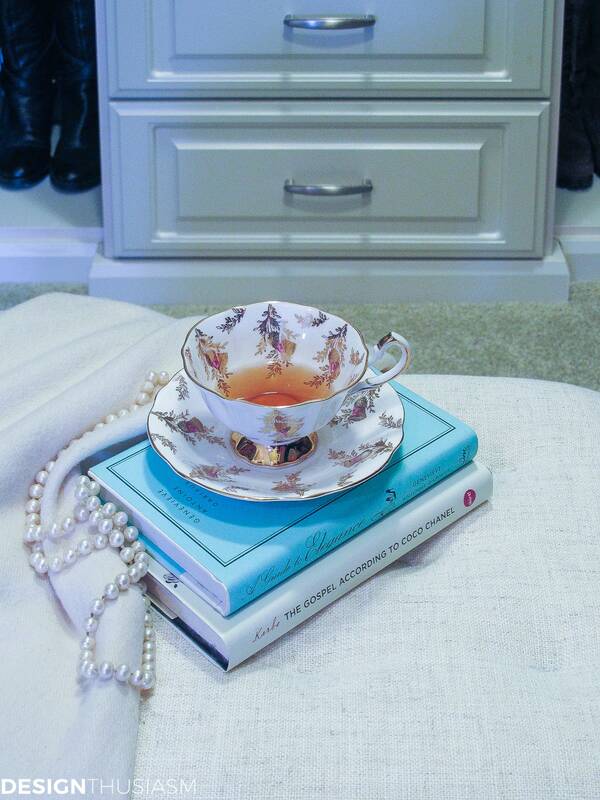 If you have a walk-in closet, another nice feature is to add a small ottoman to sit on while you dress. I’m one of those people that’s crazy about matching hangers. 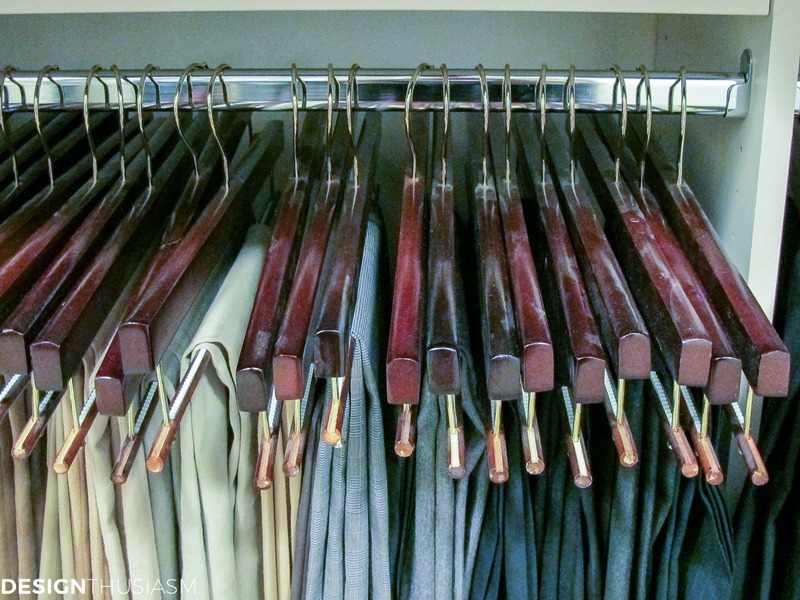 Nothing makes a closet look messy faster than hanging your clothing on flimsy dry cleaning hangers, half broken and all at different heights. Trust me, I know. In the spirit of full disclosure, you will notice I’m only showing 3 sides to this closet. That’s because hubby’s things are on the fourth side and he refuses to let me change his hangers! In addition to wanting my clothing easy to find, my other key issue is keeping things dust free. For that reason I’ve added a few shelves with glass doors, a perfect place to keep less used accessories. I also included a few specialty hooks that would help corral items requiring individual treatment. For hubby I added two pull out tie racks, as well as another for hanging belts. 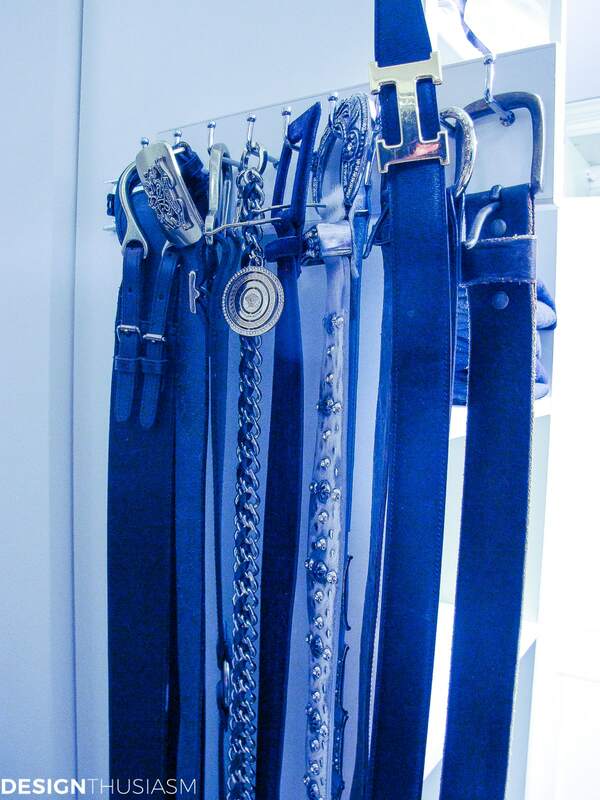 I also added a belt rack to my side of the closet, another set of hooks that slides out for easy use. 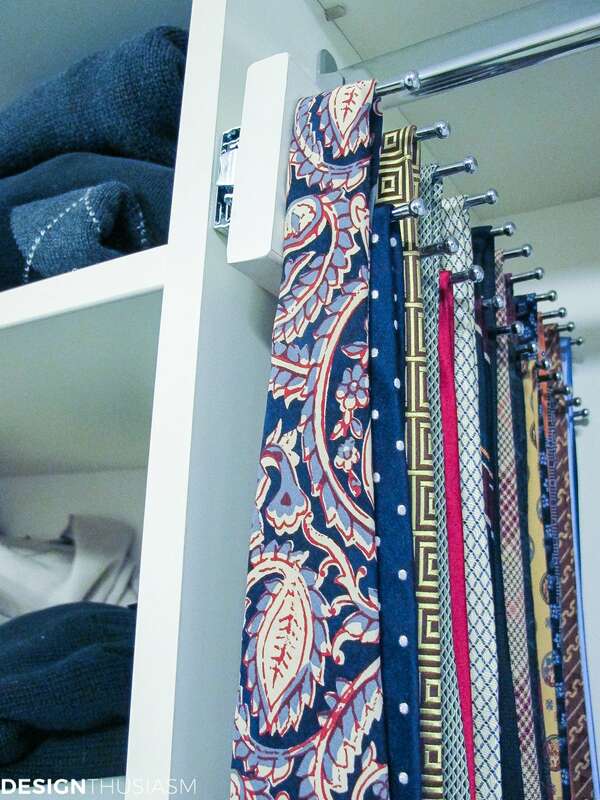 One of my favorite extras is the valet hook, a great way to prepare an outfit for a special event. It’s also a great place to hang the clothing that otherwise winds up thrown on a chair. 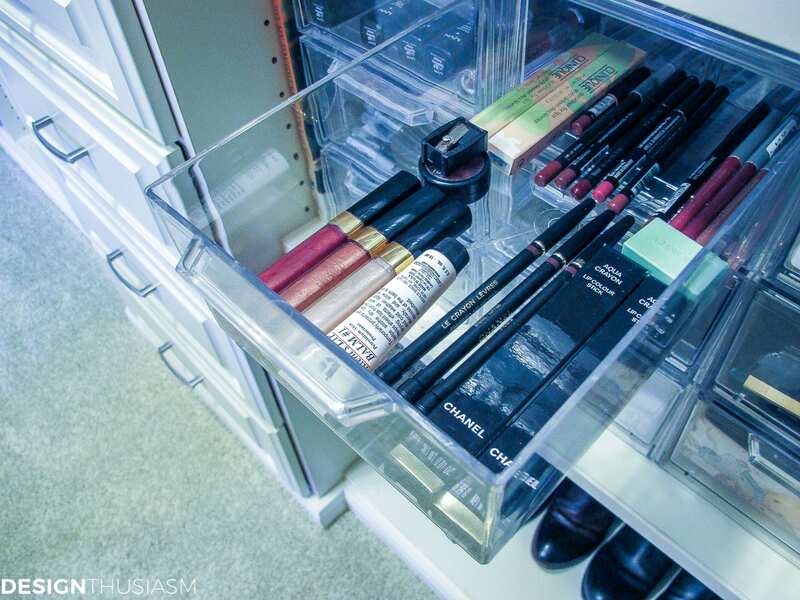 I often buy cosmetics in bulk for convenience, and while I keep my everyday items on my dressing table, I keep the extras in the plastic drawers. 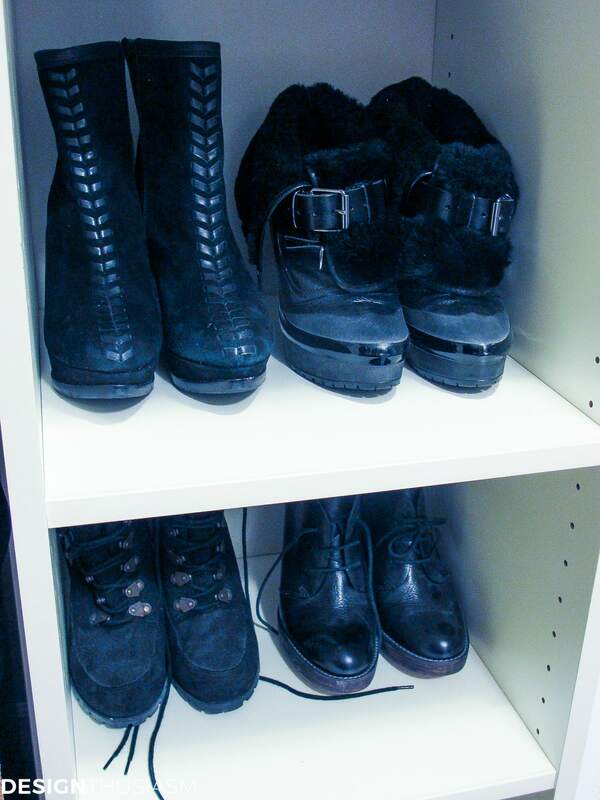 I left taller space at the bottom of the shelving to accommodate my boots. Inexpensive plastic boot trees help keep the boots lined up neatly while ensuring they maintain their shape. 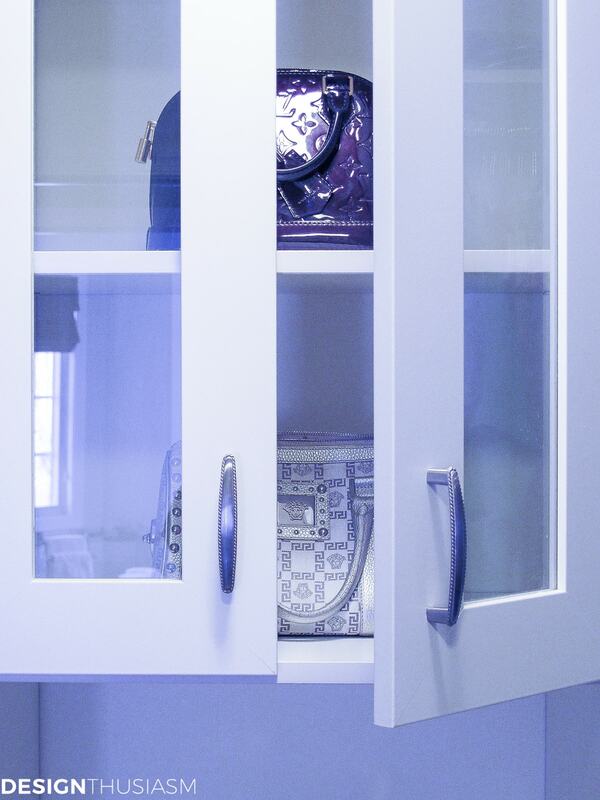 On my top shelves I store less often used handbags, but always keep them covered in plastic or their dust jackets. Above is a glimpse of the closet shelves with the plastic bins filled with everything under the sun. 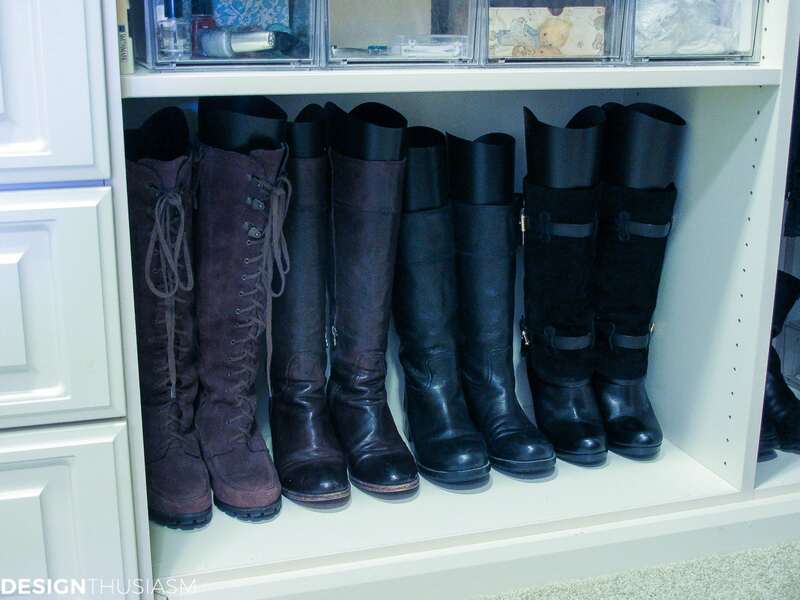 For shorter booties I use a narrow shelf… as I said, I keep shoes everywhere! I even have more plastic drawers tucked beneath my hanging clothes and, of course, they hold more shoes. 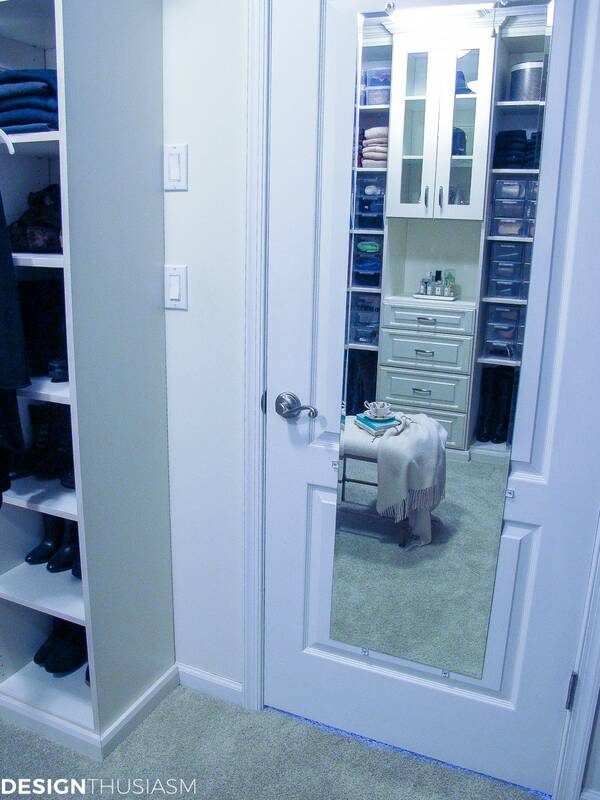 Above is the second valet hook and below you can see a full length mirror attached to the back of the closet door. I remember once filling out an online questionnaire that asked ‘what do you have on your closet floor?’ I answered then, as now, with all honesty, absolutely nothing. What do you have on your closet floor? Ah, I look forward to seeing yours, as well… 🙂 Thanks for the kind words and for taking the time comment!! 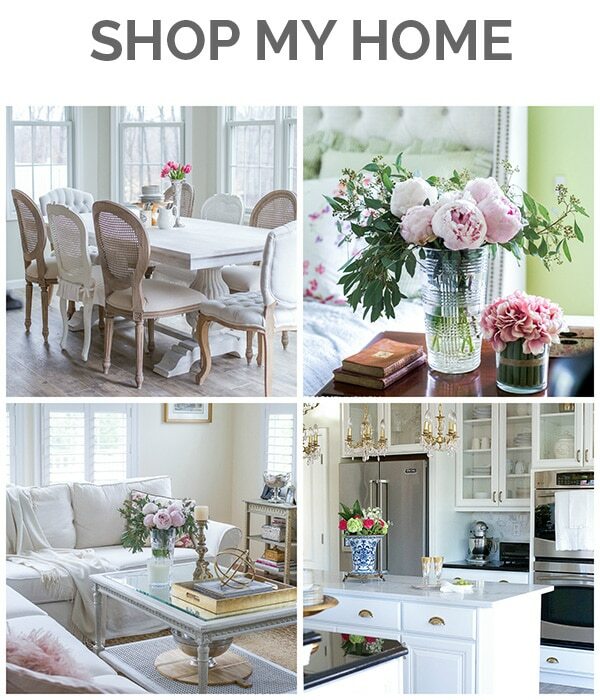 I’m with you…I don’t function well if things aren’t organized. It just makes life so much simpler and less time consuming when you have everything compartmentalized. Those clear plastic boxes are great for shoes. 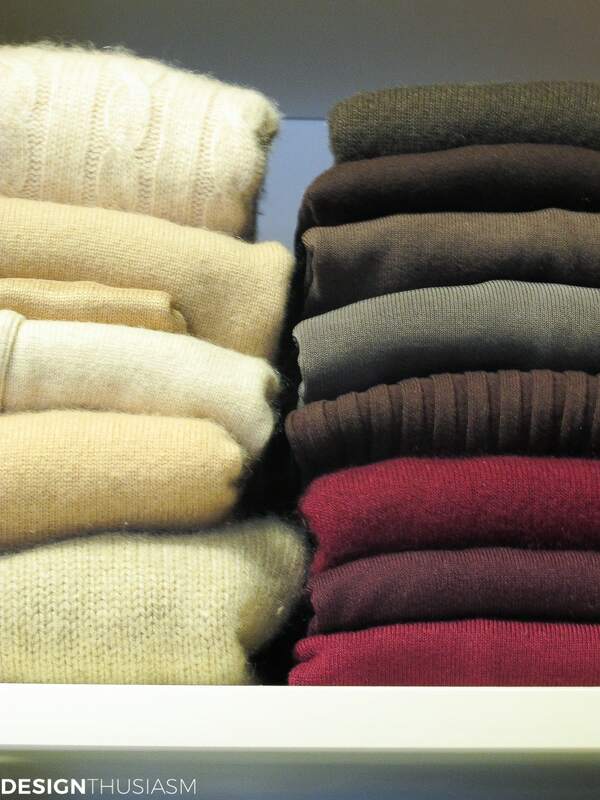 I find that clothes create a lot of fiber dust, so anything that can be stored in containers stays much cleaner. 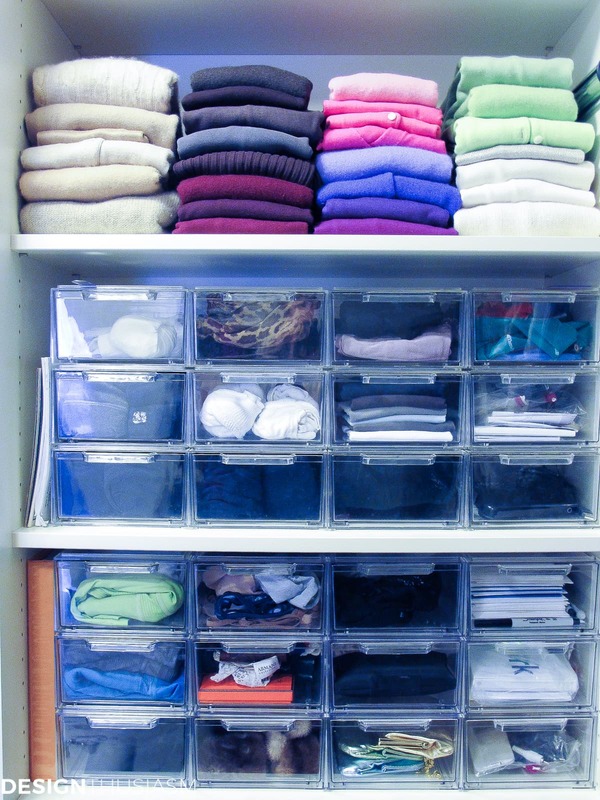 Like you, I organize by color…so easy to put an outfit together in a hurry. 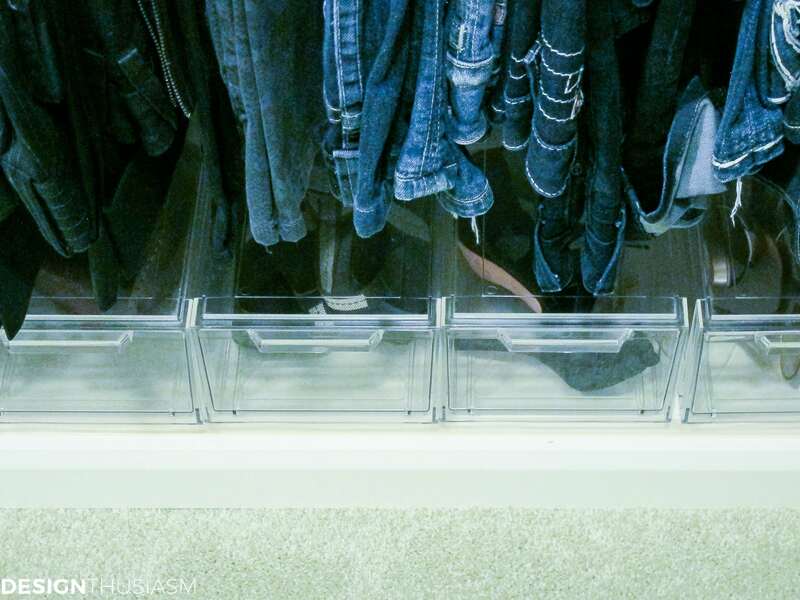 Enough talk about closets…I’m loving what’s IN yours! You have beautiful clothes and shoes, girl. Really amazing! I feel that I am pretty organized, but I don’t hold a candle to this! We have a walk in closet, but it’s a narrow L shape. I have two shelving units one for me and one for hubby filled with baskets. I agree with the hangers all alike theory. Most of mine are, but I need to go buy another package. I’ve used the velvety ones from T.J. Maxx. The problem that I have is my boots. They are just sitting on the floor underneath my clothes on hangers. I need to figure something else out. Thanks for sharing with SYC. Thanks so much and thanks for hosting!! Oh My Gosh! Organized and you smell like Jo Malone. 🙂 Can I be your friend? 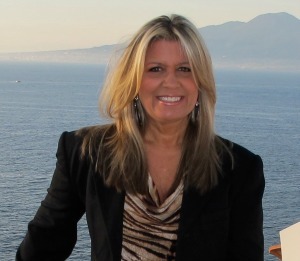 Thanks, Sheree! Rick gets about one wall out of the four… lol! I think it’s 10′ x 10′ if I remember correctly. We’ve very similar closets, except that I don’t have a full length mirror nor the Chanel book(s) – I have Agatha Christie biographies (there are several) and a book or two on her home. Oh, and flowers (thanks to you). 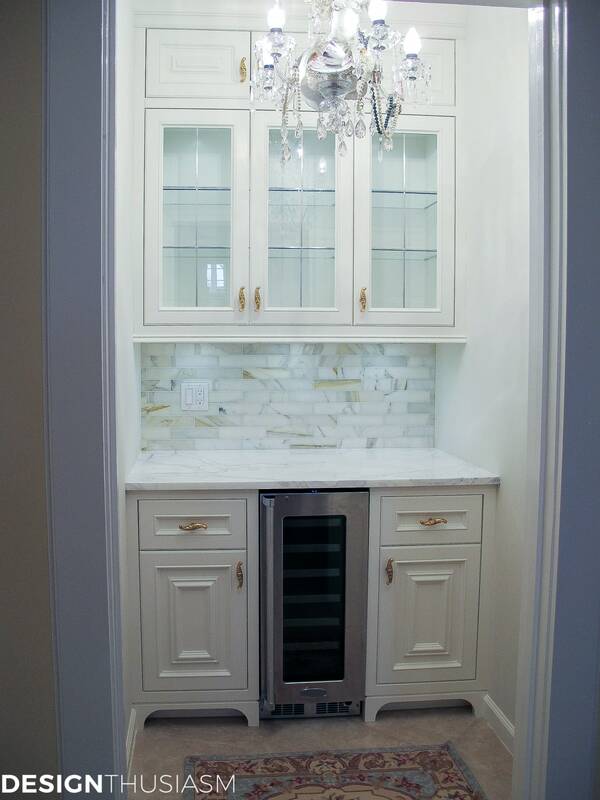 Beautiful closet that matches the rest of your beautiful home! 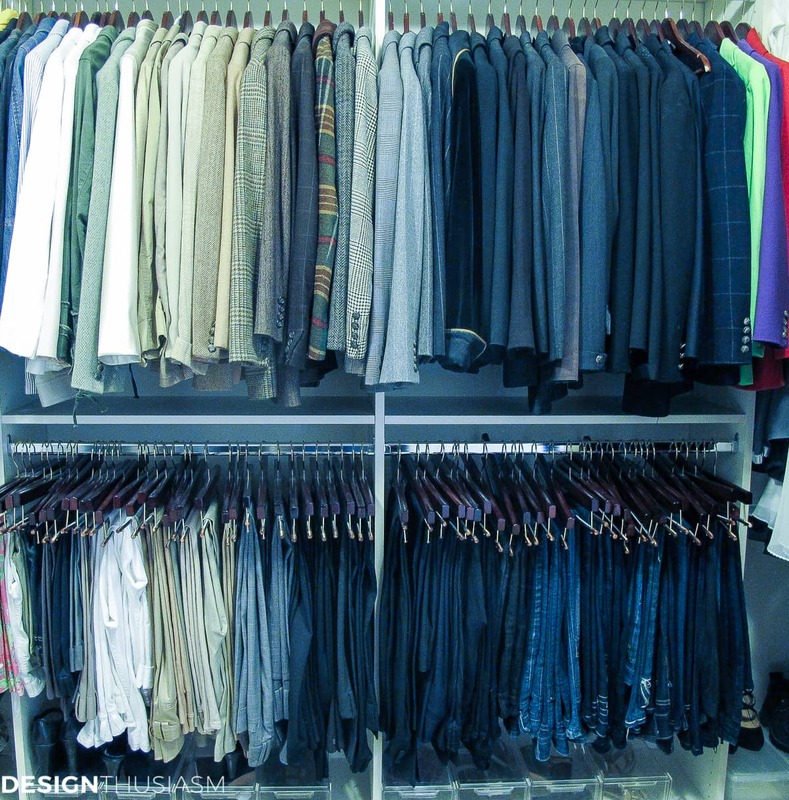 I have a very large walk-in closet so to have it organized would be wonderful. Seems like when we don’t have space for something I always say put it in the closet. 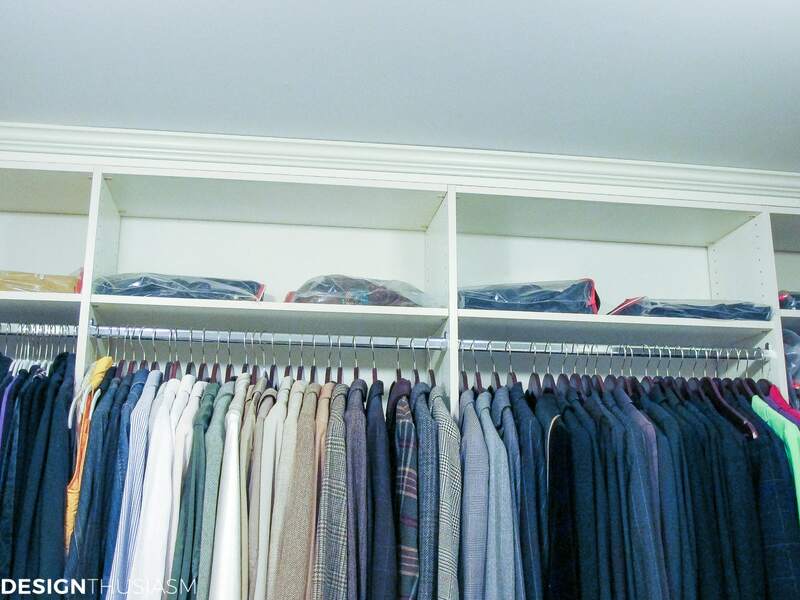 Your closet is the size of a small bedroom. So envious! You might be a bit OCD. ? My walk in is long versus wide but I do have it well organized. All my hangers are white and my clothes are organized by tees broken down to short, 3/4, long and organized by colours, then shirts, sweaters, jeans, pants. My dresses hand on the back of the closet bar with long duster sweaters and bathrobes. My shoes are on racks, organized by style. I love a closet that at first glimpse you find your outfit for the day. Oh, and my hubby gets a small rack for his minimal amount of clothing. He’s not a shopper and doesn’t care about clothes. I guess that’s my good luck. More room for me!? At the start of every season, I look over my clothes, discard any that don’t fit, are spoiled or outdated. That way I know what I need to shop for. I must admit that I have a thing for striped tees and have far too many. Why do I keep buying them? My coats and jackets are in a large hall closet. During seasons of cold or rain that is all most people see, so I have many. If it’s an addiction, then not a bad one. Closet talk gets me excited. Crazy, eh? Beautiful closet and organization. I’m curious as to where you bought your hangers that you use for your slacks. Your link did not show these….from what I could tell anyway. 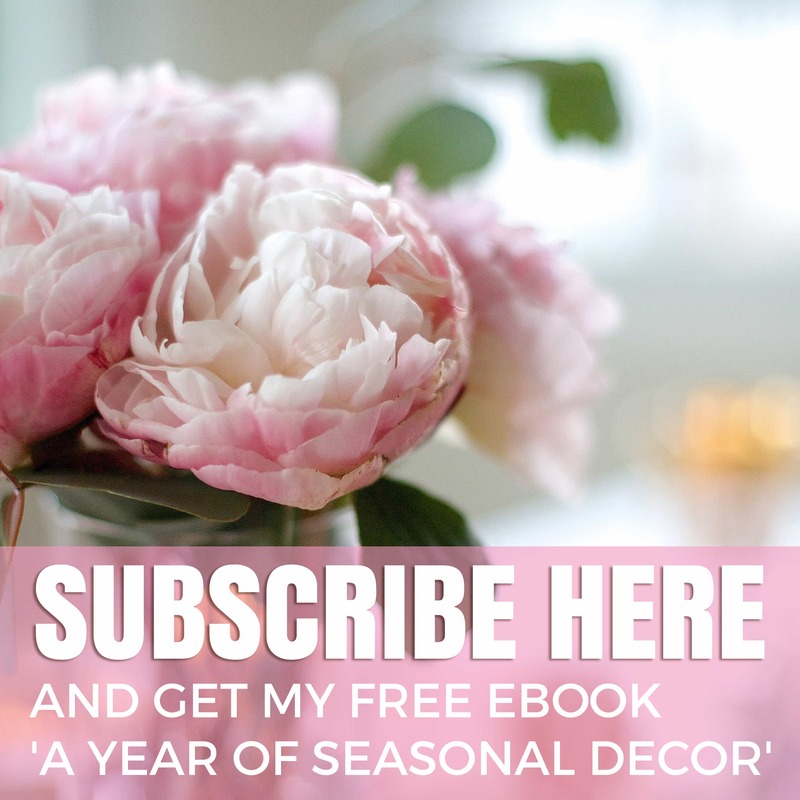 Hello, I am getting serious about organizing one space at a time and enjoyed this post. I have already implemented the clear shoe box tip. A couple of questions— how do you organize necklaces and bracelets? I’m tempted to hang my costume necklaces but not sure if that is a good idea. I plan to purchase a clear craft box to store earrings. Thank you for posting organizing suggestions! I used to hang necklaces in my old home and I actually love that idea. I never put the hooks up here so right now, I have them in a clear box, but I don’t wear nearly as many necklaces as I do earrings. For bracelets, I keep them in a small box in a drawer, as well. But again, I’m more of an earring girl than anything else. Beautiful! But I’ve got to ask…WHEN do you wear all that stuff! ? Haha! I’m a jeans and blazers girl, so that’s what’s mostly in my closet. But like most people, I tend to wear the same 3 things all the time… ??? Thank you so much and wishing you the same!! My husband is going to put together a closet unit for me next month. We purchased the closet maid units at Wayfair. It was reasonably price. I also purchased clear boxes for my shoes. Sounds fabulous, Rose! Let me know when it’s up. Can’t wait to take a peek!